Quick serve Italian eatery to shutter. daVia, a "fast casual" Italian restaurant in the Super Target-anchored Perimeter Place near Perimeter Mall will permanently close March 16th. The restaurant, which opened in late 2013 , was part of AmRest Holdings, one of the largest independent restaurant companies in Europe. AmRest has had a bad go of it in metro Atlanta, having previously closed their two La Tagliatella locations in Midtown and at Emory Point in 2014. The 2,400 square foot Perimeter space first opened as Doc Green's Gourmet Salads in 2006, and remained until the closing in 2013. 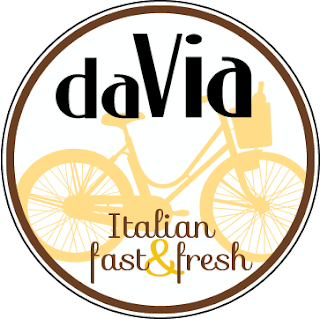 Originally opened as daVia Italian Market Eating, the branding and logo were later tweaked and is currently daVia "Italian fast & fresh." One of the restaurant's signature items was a "piada," described as an Italian burrito. Although seemingly not as poular here, another restaurant chain is pushing the piada and doing quite well. Columbus, Ohio-based Piada Italian Street Food started in 2010 and has now grown to nearly 25 locations in multiple states. Piada was named a Nation's Restaurant News 2013 "Hot Concept" and has attracted investment from well known private equity firm Catterton. Despite what appeared from the outside to be a slow restaurant, AmRest was able to sell the restaurant to franchisees Jenelle Waller and her brother Andrew. "J&A Siblings, LLC," the holding company owned by the brother and sister duo, purchased the restaurant in July 2014 according to Jenelle's LinkedIn. Additionally, according to her LinkedIn, she was previously "Manager of Training and Culture" at AMREST, LLC for about seven and a half years before purchasing the business. What makes this closure odd is that as recently as January 18th, the owners posted a message to daVia's facebook page seeking investors to grow the brand (beyond Atlanta). 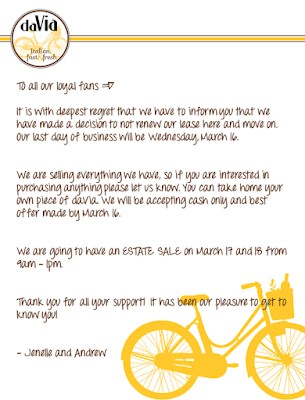 The closure announcement was posted to the restaurant's facebook March 1st, and included news that they plan to have an "Estate Sale" March 17th and 18th during which "everything will be sold." Did you ever patronize daVia? 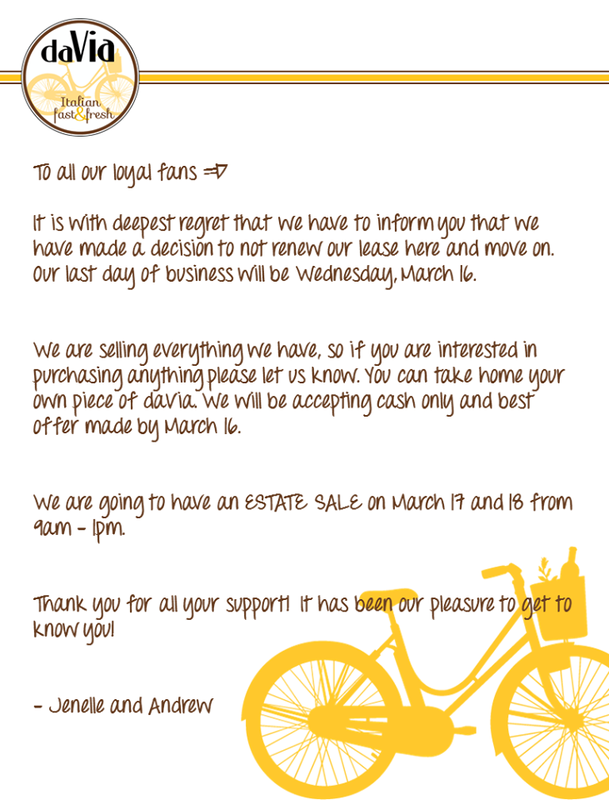 Are you surprised that they are closing? What would you like to see open in their place? My family ate there a handful of times, great options for small children. The food was great quality and staff were helpful. Sad to hear this news. Really, really loved eating here. Not shocked but saddened by the news. Went there many times, but it was never busy. The piadas were great and filling. Hopefully that other chain will make there way to Atlanta with better luck. What is going on in that shopping center? In the past couple months, Carter's closed and the space next to MiMi's became vacant. Really hoping for a (majority) overhaul in this shopping center. I live behind it and we only ever frequent Target, Ali's Cookies, Taco Mac and Chipotle. Cheeseburger in Paradise has been closed for more than 2 years, the Office Max space has been empty for about a year, now Carter's is empty too. No one was ever at da Via and I can't imagine the furniture stores get that much business. It would be nice to see some of the national chains close to make way for locally owned dining more similar to what you find inside the city or in the suburbs. Dunwoody in general needs a bit less corporate/chain look to it. Sadly, most restaurants are empty around dinner time and on the weekends since the majority of the people in Dunwoody leave to eat in trendier areas. The problem is Dunwoody officials at the behest of many of the blue hairs and parents wanting incorrectly fearing apartments will bring more children are keeping apartments out of the dunwoody part of the perimeter and so you don't have the support at night in this corner. There are 100s of multifamily units in the same parking lot as Da Via. And literally 1000s, 1000s, within a short walk or drive. So that certainly isn't the problem. We really liked this restaurant, but like others have pointed out, it wasn't very busy at night. One of the problems might have been that the food was too simple -- stuff that could easily be prepared at home, so even those in the area choose other options for dinner. Carters relocated to the plaza off Ashford Dunwoody near DSW and Walmart. 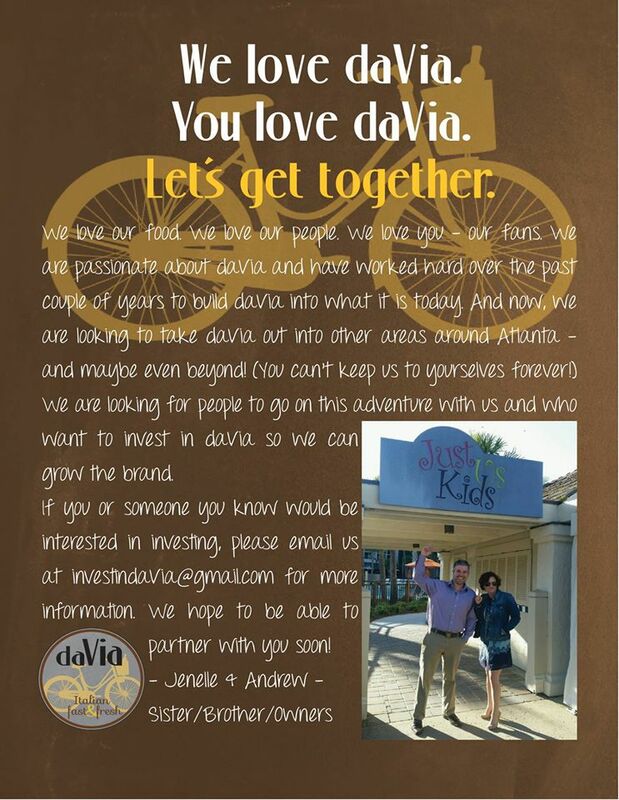 So sad to see DaVia go. Had one good last meal on the last day. Andrew (owner) is so sweet and cute. Good luck to him and his sister.